Riccardo Ricco and the “spin class” penalty. The new doping deterrents. Maybe the UCI needs new punishments. In the latest issue of Procycling Magazine, Italian Riccardo Ricco said he’s still haunted by flashbacks of being thrown out of the 2008 Tour de France after testing positive for CERA. But being kicked out the Tour and tossed in a French jail was nothing compared to the horrible punishment he was later forced to endure. A punishment that brought him to the brink, rock bottom. Ricco was forced to teach spinning classes at a local gym. Picture that if you will: the bold and brash Ricco, the self-styled “Cobra,” leading a spin class. Could there be any more demeaning punishment? The man who destroyed the best climbers in the world on the Col d’Aspin reduced to helping chubby Italian housewives lose weight pedaling stationary bikes. Now that’s punishment. Shouldn’t president Pat McQuaid of the UCI be looking into that kind of punishment and other creative deterrents? 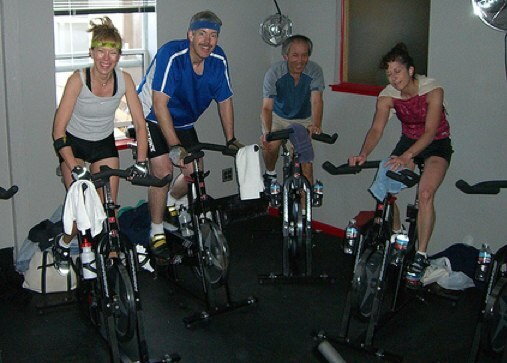 Ricco admitted the spin class experience taught him a lesson. “It really shocks you. And humiliates you,” said the Cobra. You bet it does. Especially when 25 ladies yell at you to slow down and question your musical selections for the class. Twisted Spoke thinks this opens up a whole new level of punishments. You want to send a no doping message to riders with huge egos? Make them do menial tasks. Spin class is just the beginning. What about forcing them to teach needlepoint to seniors? Scrap-booking seminars for the blind? The two year ban and a meaty fine is all well and good but the fear of teaching spin class again is what will keep Riccardo clean. « Saxo Bank winter camp goes awry. Team buried in avalanche. Yo Detroit! You’re right — out here in Cali there are some spinner babes. But I had to go for comedic effect. Thanks for checking in.